This map shows the state trunk highway system and county trunk highways. This map show surface type on state and county trunk highways and the locations of state parks and free public camp grounds. Also included is a distance finding table and explanation of its use. The map includes a distance table and insets of Superior, Ashland, Marinette, Green Bay, Appleton, Manitowoc, Oshkosh, Fond Du Lac, Janesville, Sheboygan, Stevens Point, Wausau, Waukesha, Madison, Eau Claire, Milwaukee, La Crosse, Beloit, Racine, and Kenosha. 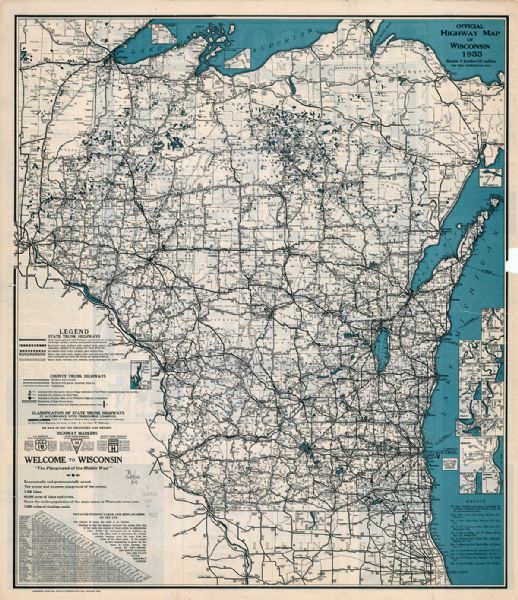 The back of the map includes text pertaining to Wisconsin scenery and state parks, and an ancillary map of "Pictorial history of Wisconsin" by Laura R. Kremers.